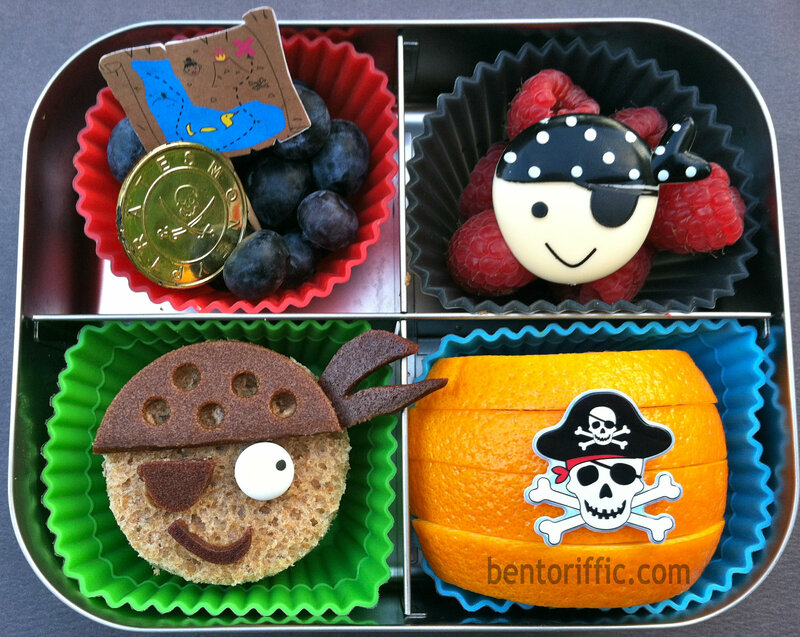 Talk Like a Pirate Day & Hop for Bento Booty! YO HO HO! Weigh anchor and hoist the mizzen! There be a pirate hop today for Talk Like A Pirate Day with booty, loot, doubloons, coins, stash and pieces of eight. That’s what ye lads & lasses will find that’s different from the other hops. It’ll be worth ye while to hop through each page this time because ye can win some serious loot so don’t try to hornswaggle your way out early! Visit every page, savvy? Me little 4 year old Buccaneer got a girl and a boy pirate. The bow, bandana and eye patch are made of Stretch Island Fruit Leather. The skeletons are Rudi’s Whole Grain bread with almond butter & jam. Me found the cookie cutter in Target last year. It’s one of me favorites. Above ye sandwiches are grape tomatoes on bones from Davy Jones’ locker. ARG! 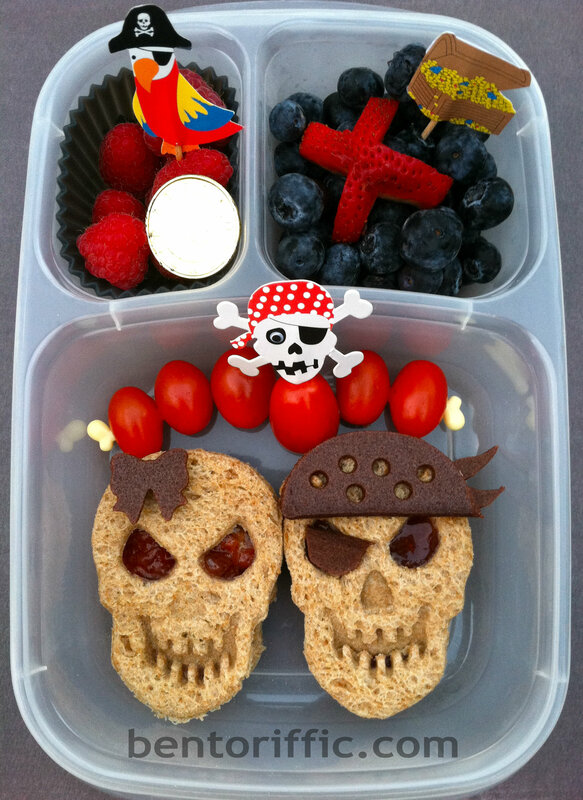 At the top left is me parrot, a gold doubloon and some raspberries, and at the top right are blueberries, a strawberry X marks the spot for the booty packed in ye trusty ol Easy Lunchboxes. What good be a little pirate if she’s got the scurvy? 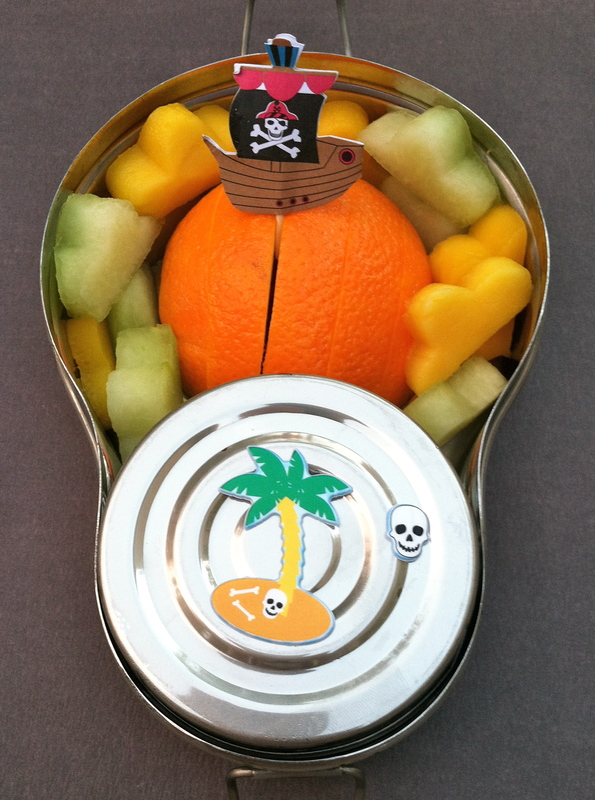 Had to send along some orange slices with Jolly Roger pick, piel de sapo and mango slices surrounding for more Vitamin C. In the tin be So Delicious coconut milk raspberry flavored yogurt packed in ye new Happy Tiffin bento container. A special thanks to me trusty bento pal for the extra pirate picks! Blimey if I don’t have another little scallawag to feed. I made her a mini pirate sammy with a Stretch Island bandana, eye patch, smile and a candy eye. At the top left are blueberries, a treasure map and a pirate doubloon. The top right are raspberries and at the bottom right more orange slices to fend off the scurvy with a sticker on top. All ye rations are packed in a LunchBots Quad. Both lassies had rum ice water in their CamelBak kid bottles. HERE ARE YE DIRECTIONS: Every Blogger Buccaneer in this here Hop has a piece of the treasure map! You’ll need to “collect” each piece and put them together in the right order to find the treasure! You’ll want some parchment and a quill, to keep a log with each clue and each number, because there are 39 scurvy pirates running amok with 39 pieces o’ the map to collect! 37 pieces will guide you to the hidden treasure (by spelling out the URL where you can enter to win!) and there are 2 bonus pieces with the “secret passwords” to get two chances to win some pirate booty! This here’s my piece o’ the map! Good luck, Mateys! did for her little scallawags. Ye Olde Contest is sponsored by Bento USA by All Things For Sale the Bento Bloggers and Friends. If any of ye lads & lasses want to check out a few past skeleton bentos from me, you can find them here! We officially love fruit in this house if you couldn’t tell. Lots of yummy options for snacks. 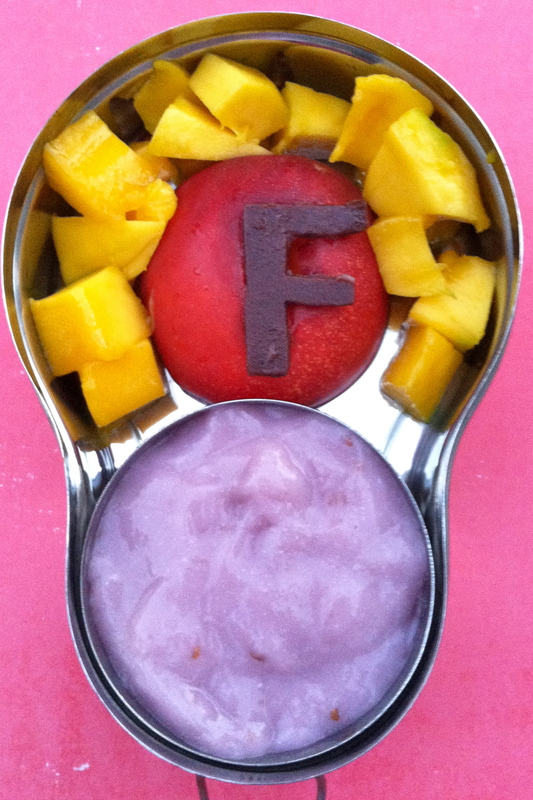 Today Miss G (4) has a nectarine halved with a Stretch Island Fruit Leather “F” in the middle. 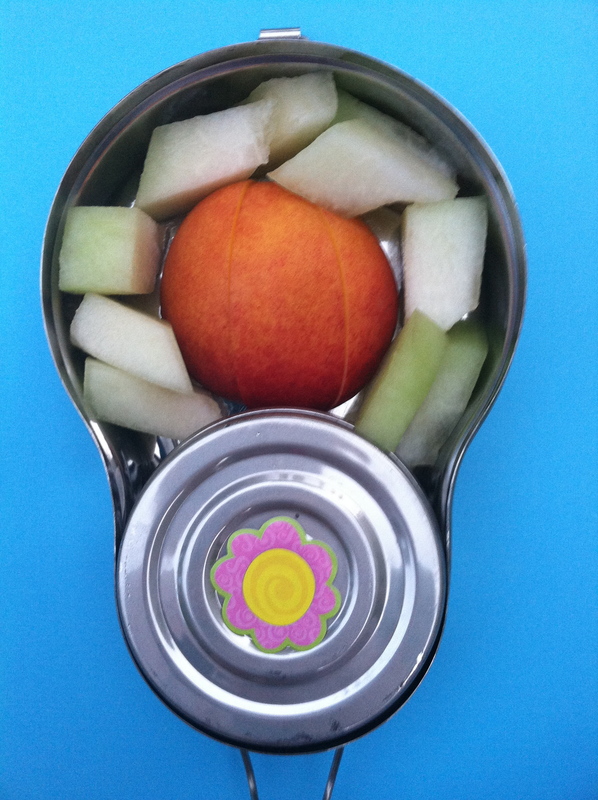 It’s surrounded by organic, local mango pieces in her Happy Tiffin stainless container. Blueberry flavored So Delicious brand coconut milk yogurt is in the bottom round container. For lunch we have a new bento box. 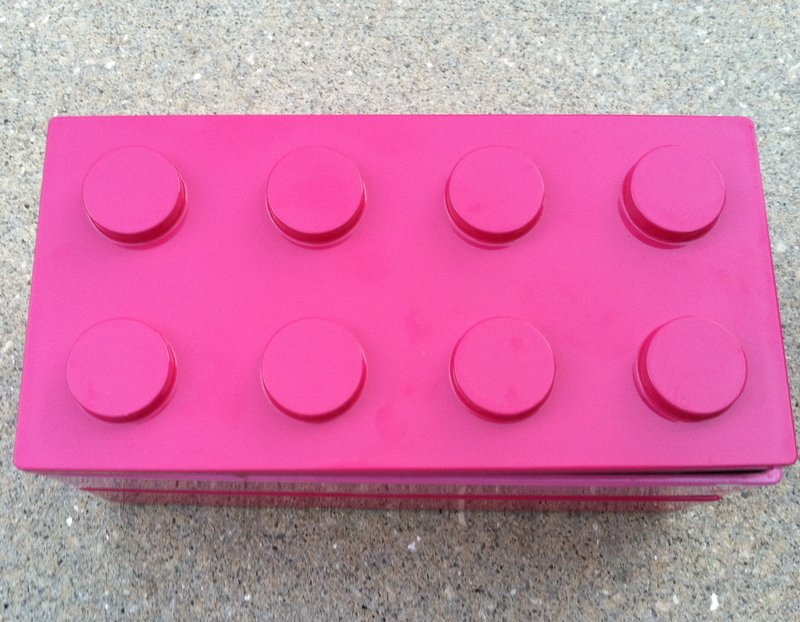 It’s a hot pink Lego box with 2 tiers. 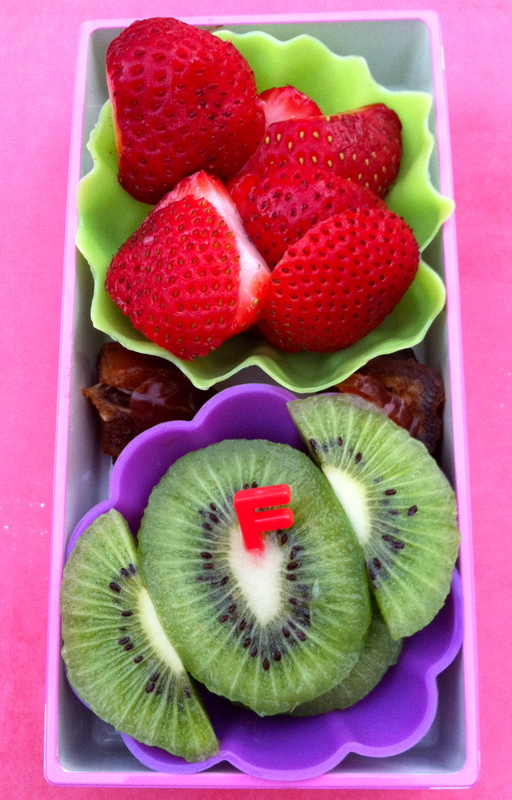 The top tier was filled with strawberries, dates in between the flowered cups and sliced kiwi. 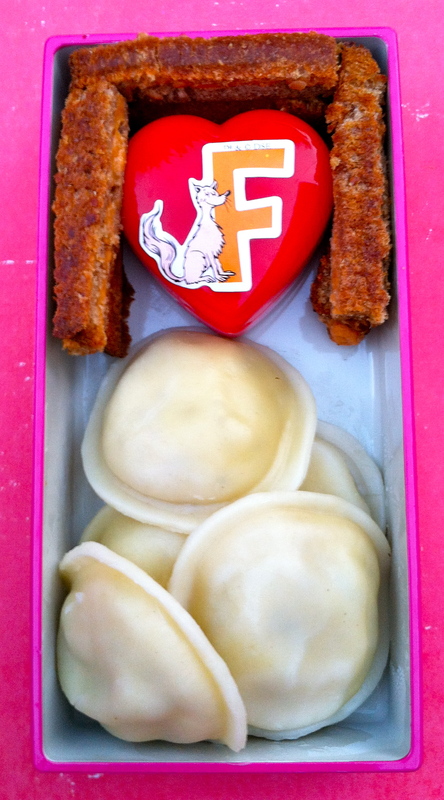 The bottom was small strips of Rudi’s whole grain sandwiches, soy ravioli and a heart container filled with dried cranberries. 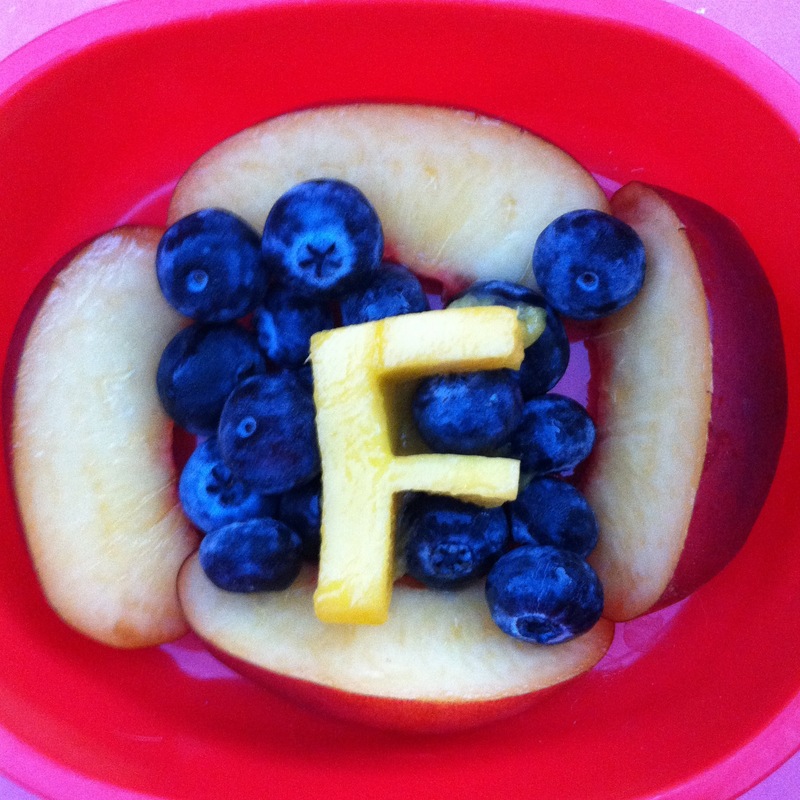 And Little Miss A had nectarines, blueberried and a mango F for her fruity afternoon snack. 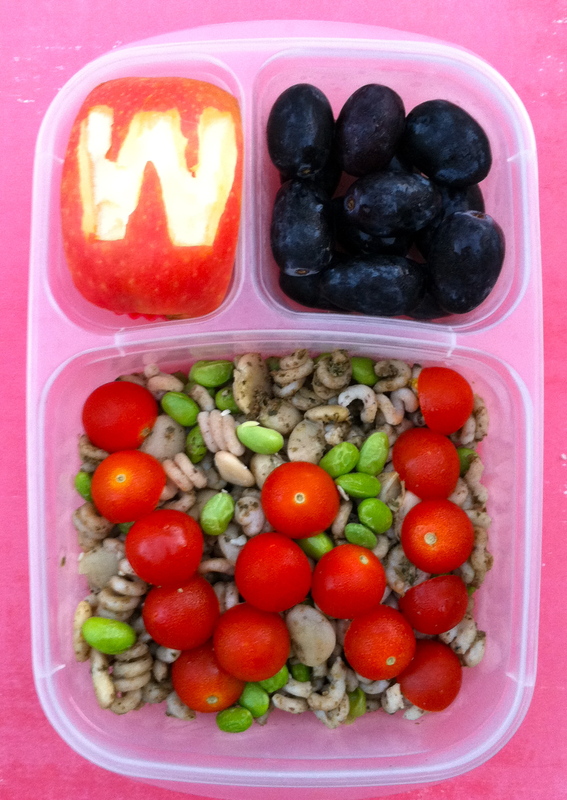 Lots of love in these lunches today. Some leftover love too. I don’t like to waste food so Miss G has leftover spelt pasta with marinara today. At the top right is forbidden rice with sweet potatoes and a baked potato heart on top from last night’s dinner. 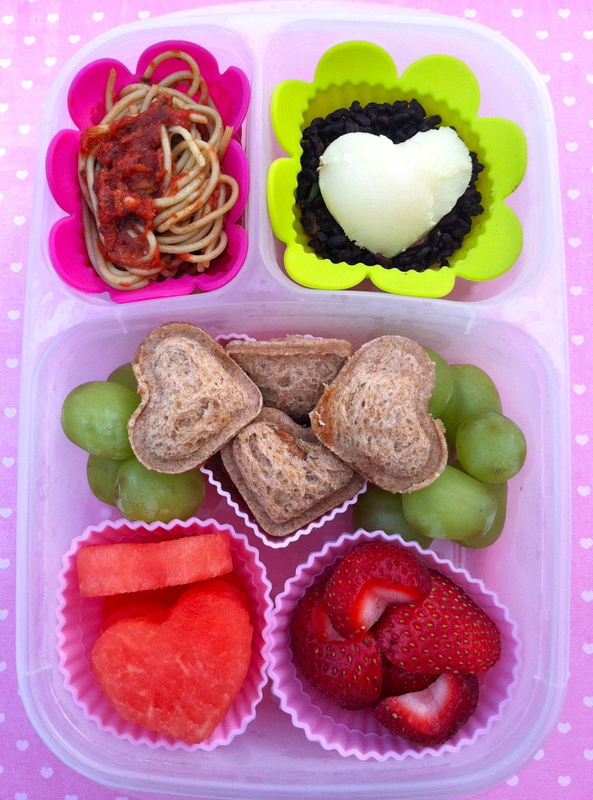 In the main compartment are mini almond butter heart sandwiches on Rudi’s Whole Grain bread, strawberry and watermelon hearts and green seedless grapes packed in her Easy LunchBoxes container. Miss G started a new preschool this fall, and she’s not allowed to have any characters on her lunchboxes, water bottles, etc. Luckily we get a ton of use out of our Easy Lunchboxes and LunchBots containers. 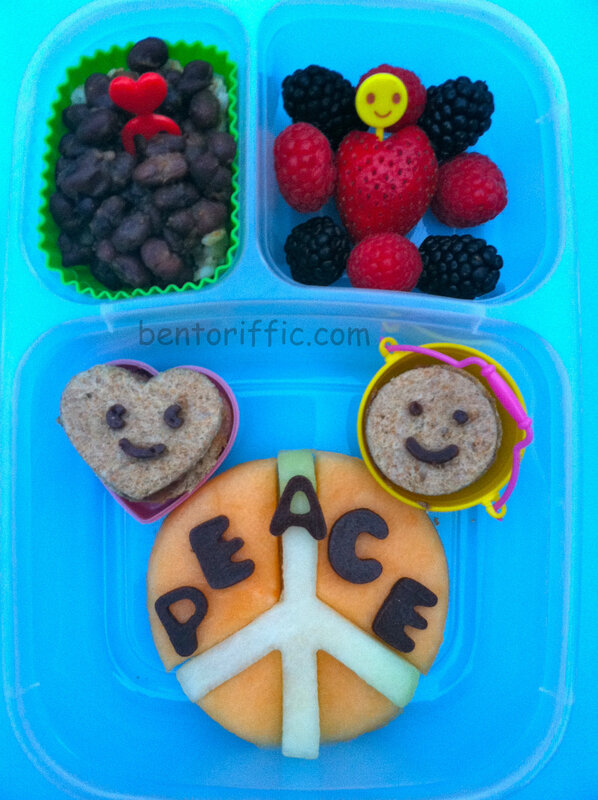 I did scour the internet for new bento boxes to have on hand, and I found a company called Happy Tiffin. They make old school tin lunchbox containers, stackable stainless containers, and they have an adorable line for kids that is perfect for us. 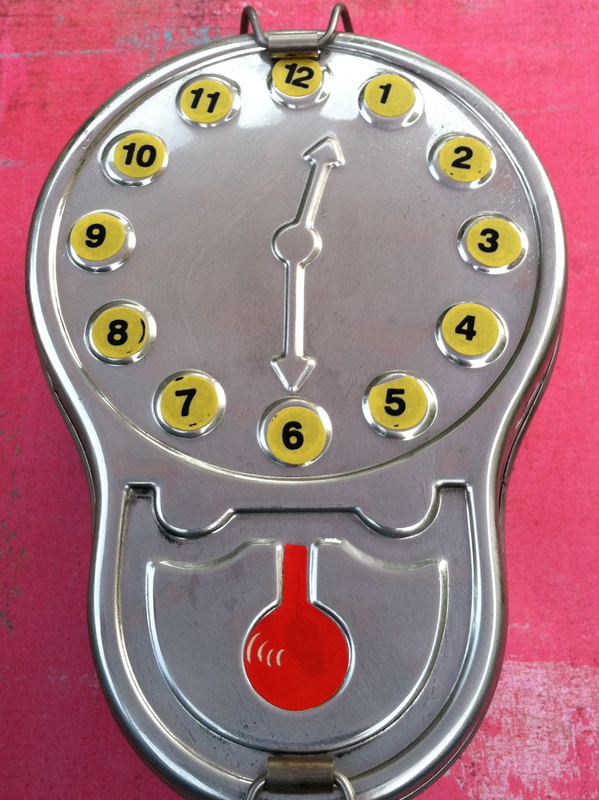 The one we chose is called “Lunch Time”. They’re a bit more expensive, but from experience my stainless bento boxes stand the test of time. Since these are going to be passed down to Miss A (2), I decided it was worth it. 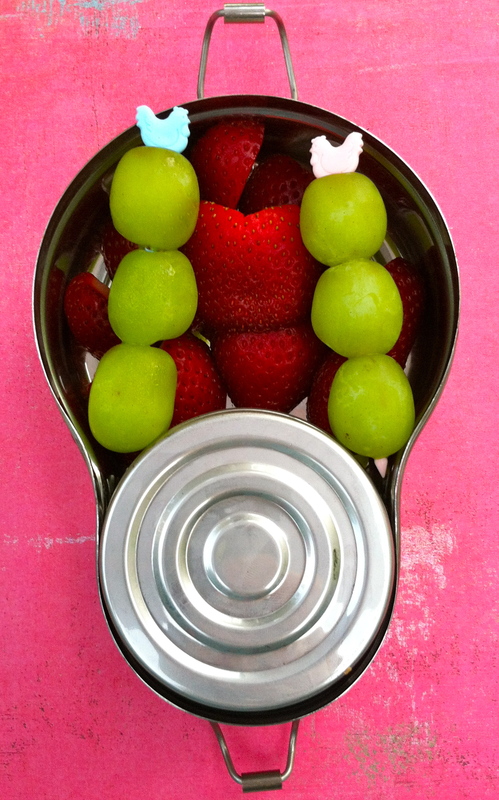 I packed the Lunch Time tiffin for snack with strawberry hearts, large green grapes and coconut milk peach yogurt in the stainless container for dipping. My husband had leftovers today too with a giant bento of leftover pasta (not shown). 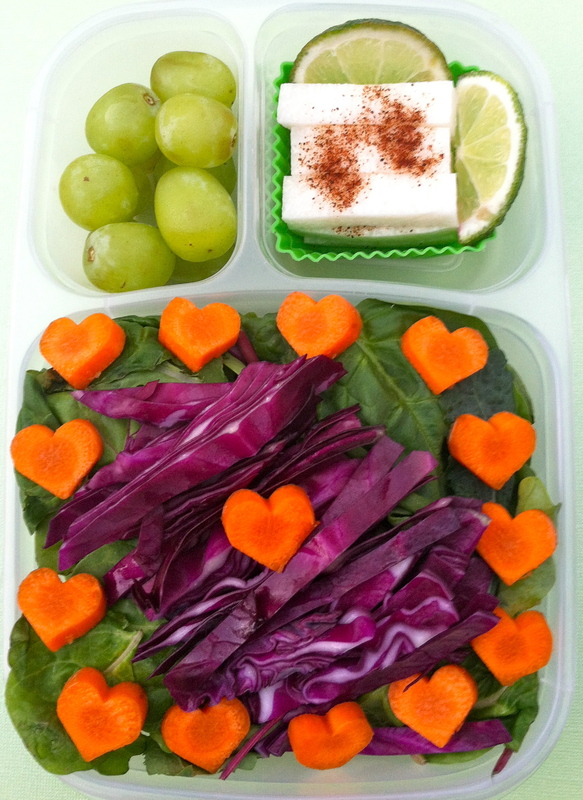 He has a mixed green salad with purple cabbage and carrot hearts. 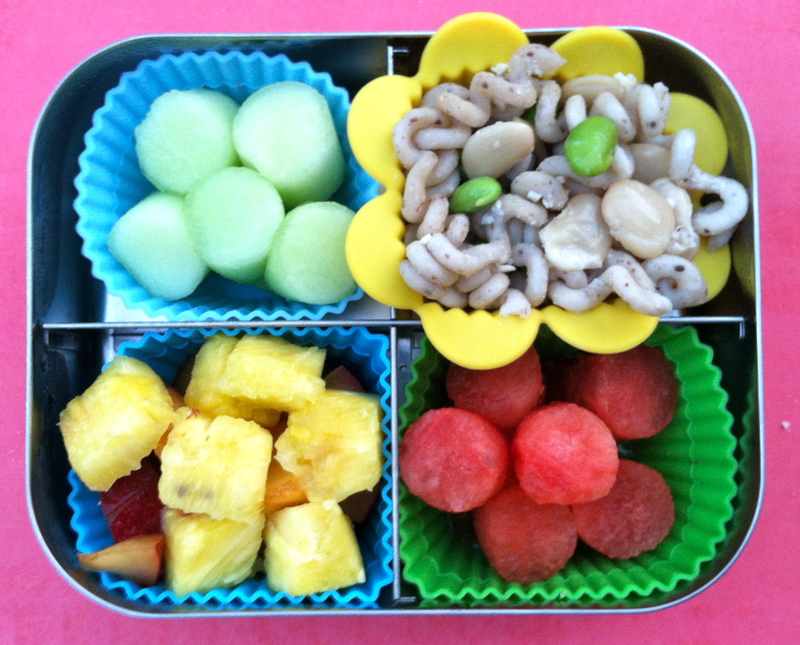 At the top left are seedless green grapes and top right are jicama slices sprinkled with chili powder and lime for squeezing on top packed in his Easy LunchBoxes container. Anything that gives me a few more minutes is something I can buy into. As a busy mom with 2 toddlers, I don’t want to sacrifice the important stuff like healthy ingredients. I’ve been trying to make more foods that are healthy, with variety and less effort on my part. Lazy? I hope not. My kids wanted a snack. I thought I’d see what I could make that could normally be cooked but could also be eaten as is in a situation like a tropical storm where you lose power in your house. I rinsed a package of cannellini beans and smashed them with a fork in a bowl. I added 2 tablespoons of mild salsa and 1 tablespoon of Tofutti sour cream and mixed them into the beans. 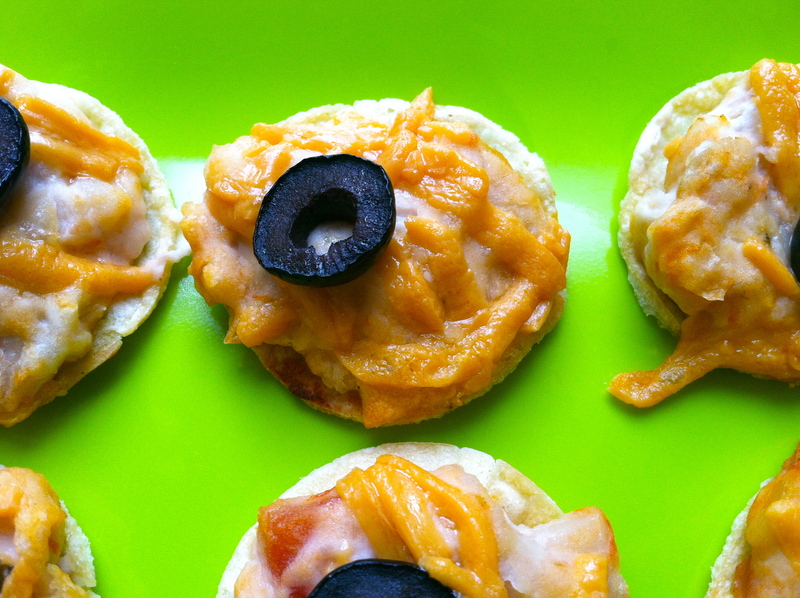 I put a dollop of each on pita chips that I had, sprinkled them with a few Daiya (dairy-free) cheese shreds and topped with an olive slice. I broiled mine for a few minutes until the cheese melted. They were yummy! My chips were very thin to begin with and got a bit mushy. I would recommend toasted bread slices or thicker pita chips. They were all gone quickly! Protein packed and fast to fix. 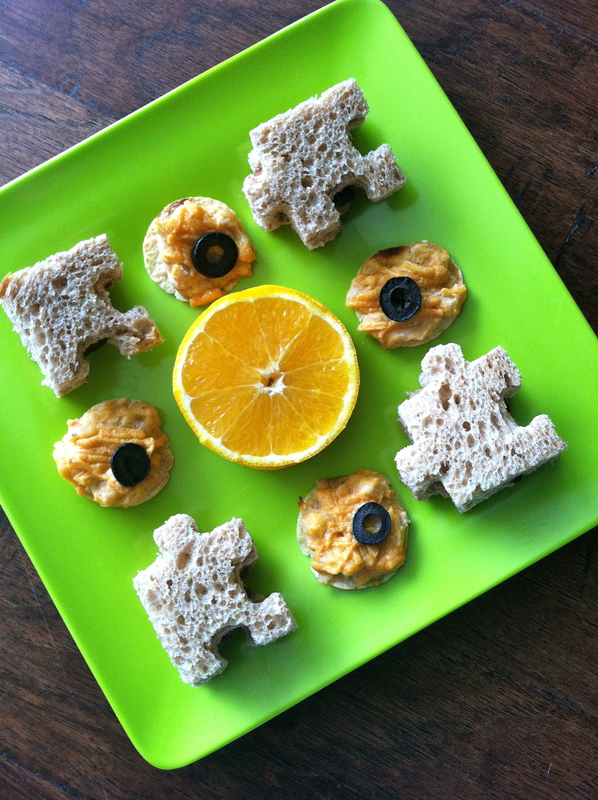 Nacho served with puzzle piece sandwiches and orange slices. Little Miss 4 year old is off to school again today. 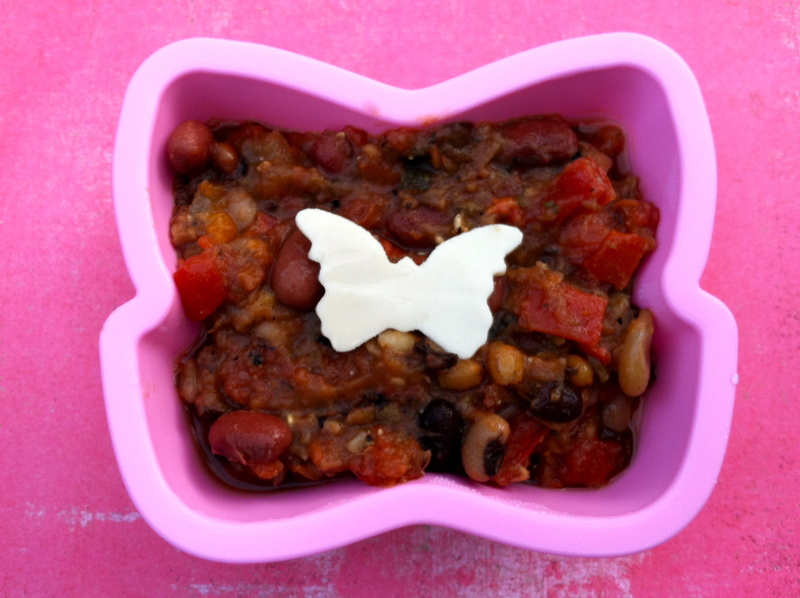 She has a butterfly bowl of vegetable bean soup with a piece of vegan butterfly cheese on top for decoration. And to go with her soup is a LunchBots Uno with grape tomatoes, homemade butterfly shaped vegan cornbread muffins, blackberries and blueberries with a papaya butterfly on top, cashews, dried cranberries and dried mango strips. Happy 4th of July! How did that sneak up so quickly? It seems like school just ended, and now summer’s half over! My lovely blogging buddies decided to do another blog hop to spark some fun ideas for your Independence Day weekend and upcoming celebrations. So proud to be a part of such a talented group of women! Be sure to click on the 4th of July button or link at the end of each post to find the next blog’s creations. My first creation is a lunch for one of the girls. It’s 3 star shaped sandwiches on Rudi’s Whole Grain bread. 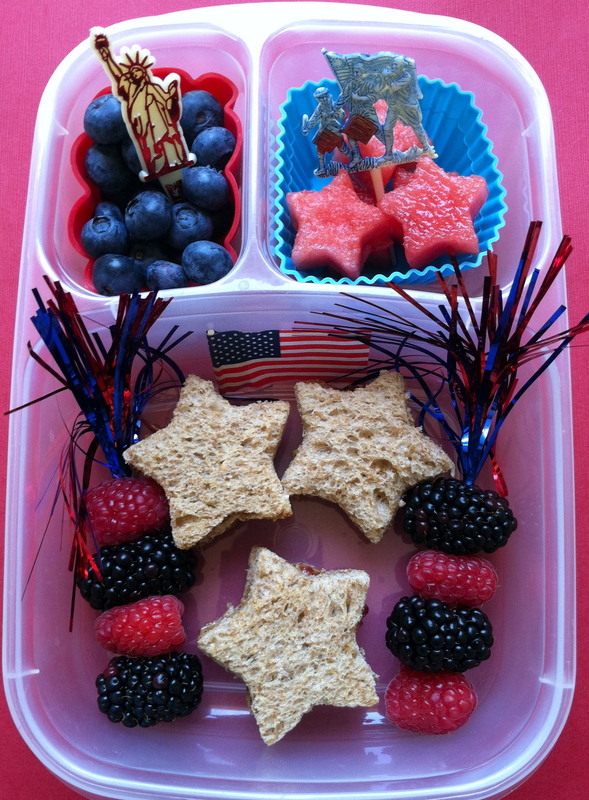 On both sides of the stars are firework picks of blackberries and raspberries and an American flag flying on top of the sandwiches. I managed to find some fun vintage picks for my holiday lunches and snacks this round. At the top left is Lady Liberty sitting on a pile of blueberries. 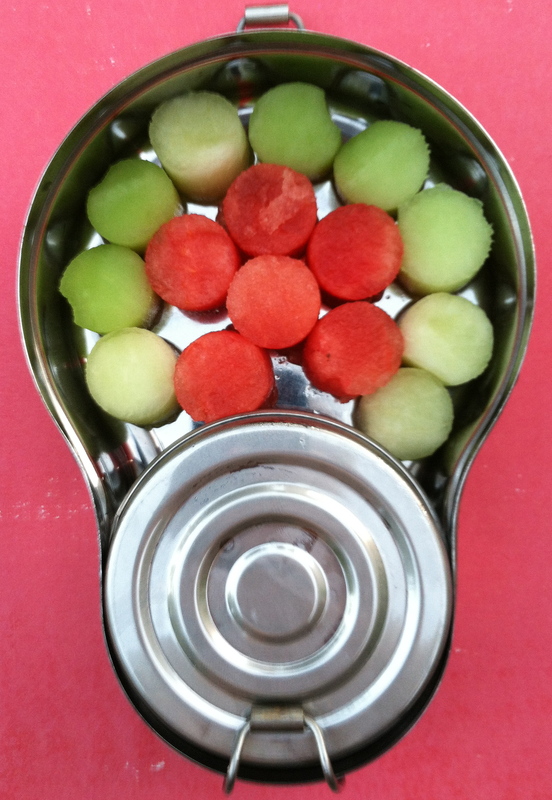 And at the top right are watermelon stars topped with an Old Guard fife and drum corps pick all packed in an Easy Lunch Boxes container. 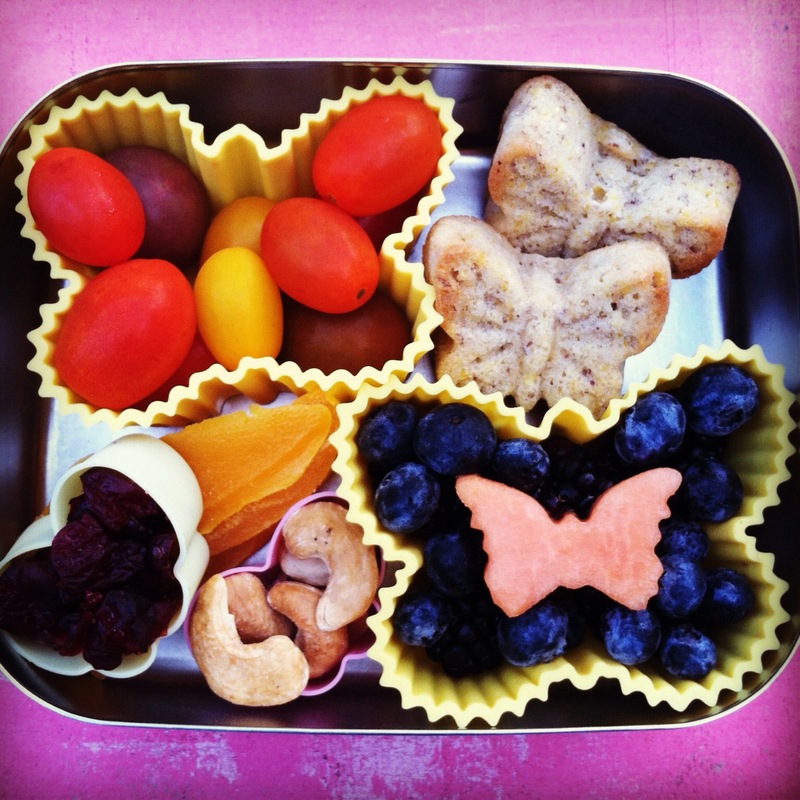 The next Easy Lunch Boxes is an afternoon snack. At the top left is So Delicious brand coconut milk mango yogurt topped with pomegranite seeds and topped with a Liberty Bell pick. At the top right are blackberries with a strawberry star and a firecracker July 4th pick. 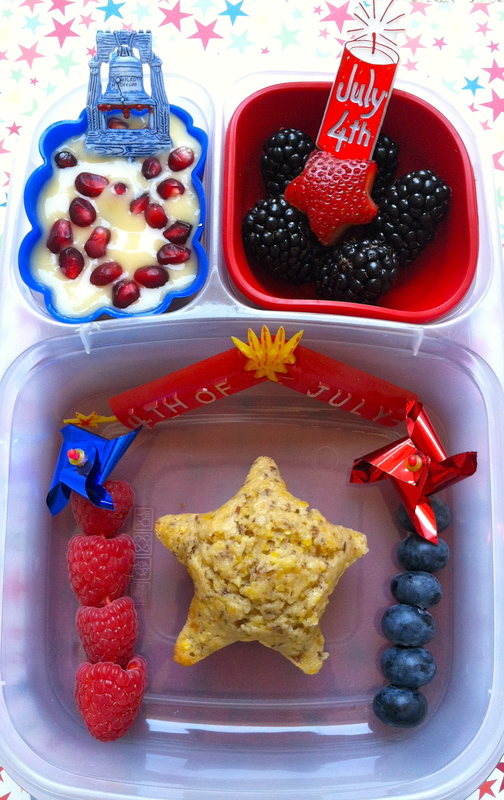 In the large compartment is a star shaped homemade cornbread muffin and pinwheel picks of raspberries and blueberries.